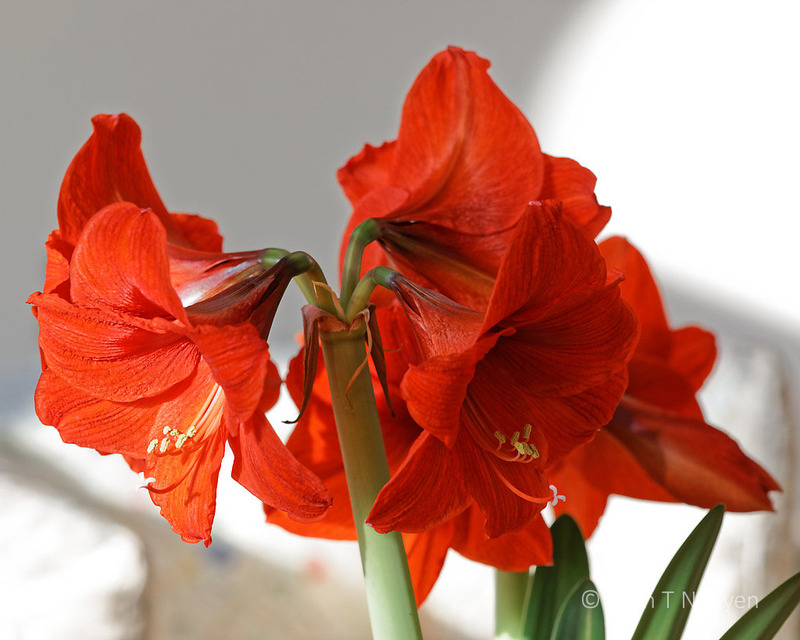 As of today, the Amaryllis I have been photographing for the past two weeks has opened six of its eight flower buds. Here are some close up of these brilliant red flowers. As the blooms grow larger, it is more difficult to capture all of them in one frame. I am already standing in another room to take the following shots. Beautiful blooms! The first shot with the light shining through is gorgeous. Well captured! Thank you Lynn! We have at least one of these flowers every year. I haven’t yet learned how to keep them growing and blooming for the following year. They are a beautiful sight in gloomy winter! Very cheering. Beautiful shots of the Queen of Christmas Flowers! These can be really stunning flowers. 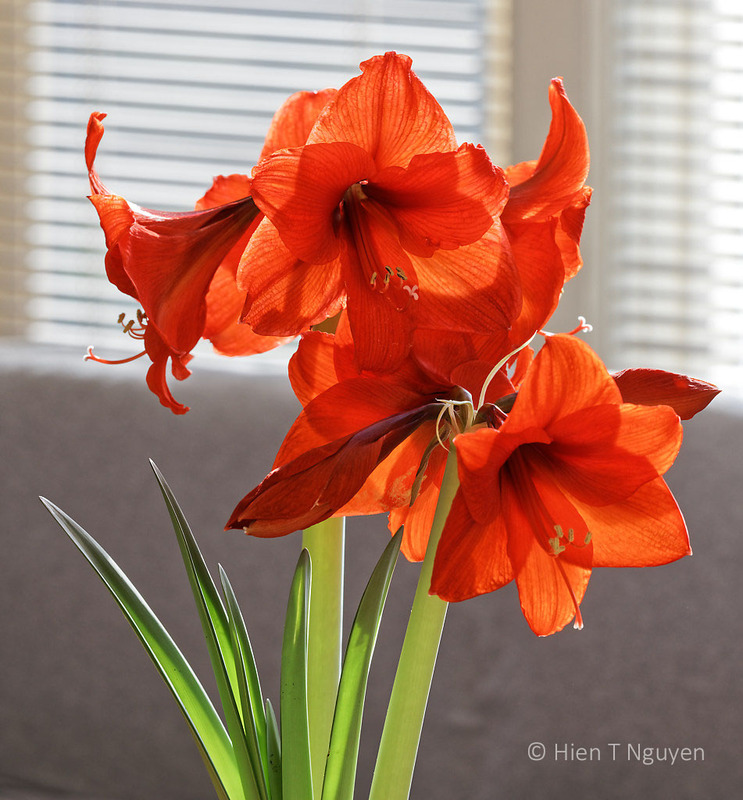 You’ve done a great job with photographing these flowers, They can be a real problem with how long the flower can be. You are right, they are not as easy to photograph as other flowers. But they are indeed stunning in full bloom. Thank you for commenting! Lovely flowers for the season! Beautifully captured. Beautiful shots. These lilies are not easy to photograph and you’ve done a fabulous job of it. It’s beautiful. I should get one of those kits for my wife for Christmas. I am sure she will like it! 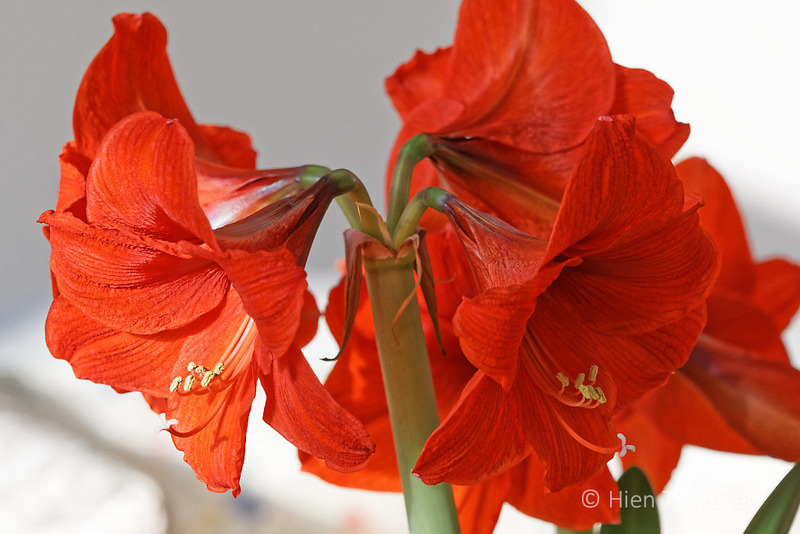 I find the opening of the amaryllis flowers to be so fascinating. First a little green pops out of the soil, then the stalk rises, then the buds are tight, then they separate slightly, and unfurl, then finally the whole flower trumpets its arrival, as you have photographed here. Incredible, gradual, and so worth the wait. Thanks for sharing yours, Hien. You have described these flowers transformation so accurately! Thank you Jet! So wonderful to see these vibrant colours as winter settles in. Beautiful. They’re beautiful, and very welcome during this time of year! Thanks. Happy you like it!